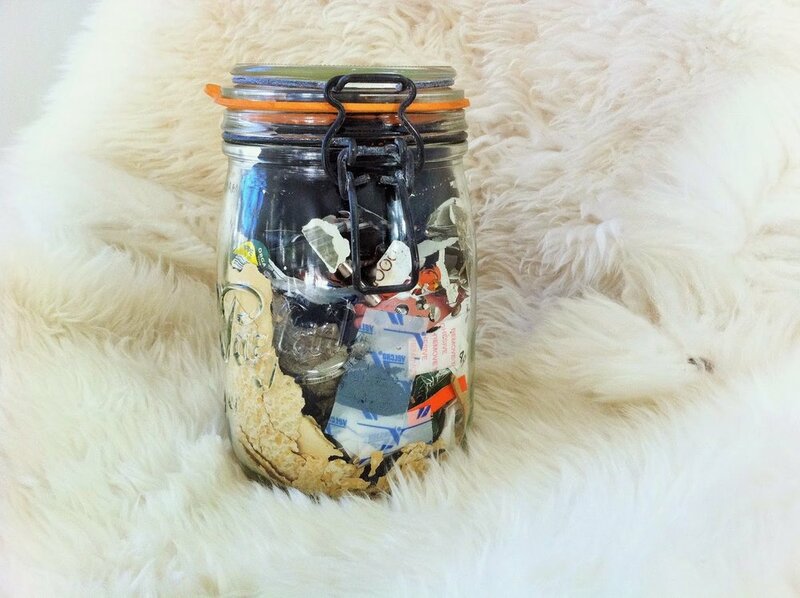 I am inspired by a minimalist inspired movement called the zero waste lifestyle which fits in well with my thinking around conscious money/conscious consumption & financial integrity. When I came across it, I wanted to learn more and it really inspired me. In the long run, being conscious in this area of your life also leads to cash savings as a by-product; this has been the experience of those who aspire towards less waste. I remember a childhood where it was normal to take shopping bags to the market. Vegetables & fruit were sold loose, packaged in old newspaper and twine - all recyclable and not much was wasted. My mother made a lot of pickles & jams and announced her need for jam jars to everyone within earshot; I often helped pick up old jam bottles for her on my little red cycle from her friends around the village. There was no food waste really as any food scraps, etc were fed to our neighbours pigs. Nobody picked up garbage and every few weeks, we had a little bonfire to burn the rubbish that couldn't be recycled, given away or sold. It was a simple life and largely plastic free. "Since embarking on the Zero Waste lifestyle, our lives have changed for the better: We feel happier and lead more meaningful lives, based on experiences instead of stuff. My goal is to share its incredible health, financial and time saving benefits!" When I saw the waste that Bea's family produced in 2014, I was blown away. She has two children and a husband and all that was in her bin for a whole year fitted in a quart sized mason jar! Do you think this would be difficult to incorporate? I don't think so but it would need us all to be more conscious of our buying and consuming habits as a household. Buying local- I try to avoid supermarkets and support my beloved Deptford High Street! Using simple, non toxic cleaning supplies -white vinegar and baking soda are perfect! I always thought it was about reuse, reduce, recyle...but never thought about Refuse. It was quite an eye opening word for me. If you are curious about this, I would highly recommend you read Bea's zero waste tips. I would love to do more and I think many of her tips are easy to incorporate. This also applies to your own spending - Aha! Yes! An earlier blog on financial integrity stresses the importance of being conscious about spending on what really brings you joy and cutting back on the rest. It is worth being really curious before you spend on why you are spending. Also, I find it helpful to think of my consumption in terms of the time it takes me to buy something rather than money; I then know how I am exchanging my hours of work in terms of buying that product/service. I am not a big advocate of being extremely frugal - eating beans and walking everywhere...no, no, not for me. However, there is a balance between buying unconsciously for quick hits of feel good hormones that do not last and the more conscious consumption of buying quality items or services that truly enhance your life in an enduring, lasting kind of way. Hope you enjoyed reading this blog; please sign up to my newsletter if you want more.. I am off to freecycle some of my kitchen items that I haven't used for over a year and oh, the de-cluttering feels good!